Chef Ryan Scott is on a sugar high in San Francisco. After eating some sweet treats at a few restaurants, he gets in the kitchen with his mom to prepare a dessert of his own. Recently Ryan has had the chance to cook with his best culinary friends -- Rachel Ray, Carla Hall and Jeffery Saad. But, the one person Ryan enjoys cooking with the most is his mom. They loved making and eating sweets when Ryan was a kid. Ryan's mom planned a visit so Ryan wanted to make some delicious desserts with her to reminisce about the good old days. To get some ideas, Ryan went to several different restaurants in San Francisco to taste their sweet treats. His first stop was at Craftsman and Wolves where they served up specialty desserts, including chocolate, salted caramel brownie; smoked almond brittle; white coffee and black sesame cube cake. Then, he stopped by Smitten Ice Cream where they churn their own ice cream right in front of your eyes. They do this by using a machine that was created by Smitten Ice Cream that uses liquid nitrogen to freeze the creamy mixture. It takes just 60 to 90 seconds to make a creamy scoop of ice cream! The shop makes unusual flavors like strawberry white balsamic. After Ryan finished his dessert tour, he came up with his sweet creation for his mom -- pound cake with caramel frosting filled with berries and topped with a caramel cashew brittle. The great thing about Ryan's brittle is that it isn't fancy. It is easy and delicious. You can enjoy it by itself or use it to top ice cream or pound cake. 1. Invert your cake pan to frost your cake. 2. Use a robot coupe mixer to grind your brittle. 3. Grind more brittle over the top of your cake for garnish. Chef Ryan Scott checks out the dessert menu at a few famous San Francisco restaurants to get some inspiration for a dessert dish that he plans on preparing for his mom. Sea salt is the perfect pairing with the sweet brittle! Drunken or not, these berries are a summer favorite! Sweet and salty! The best of both worlds! 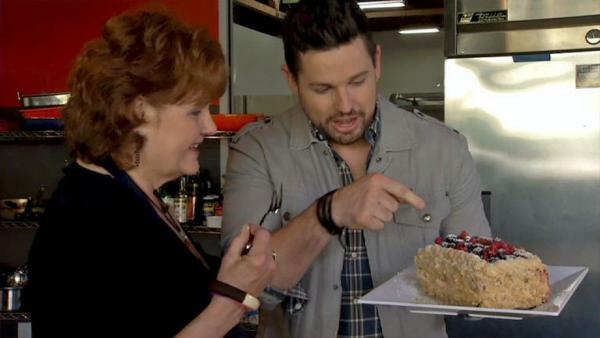 Go behind the scenes as Chef Ryan Scott makes a dessert with his mom.